“Haddonfield police said $29,200 in jewelry was reported stolen from a home in the 100 block of West End Ave. on March 10. “The items were last seen in a bedroom in the residence a month ago. The missing items include a platinum diamond necklace, a diamond in white gold bracelet, a 1.5 karat diamond set in platinum, citrine and gold ring, yellow gold band of small diamonds and a sapphire and yellow gold ring. 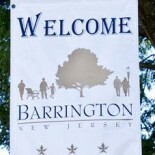 This entry was posted on March 22, 2012 by Barrington Bulletin in Crime, Region and tagged haddonfield.